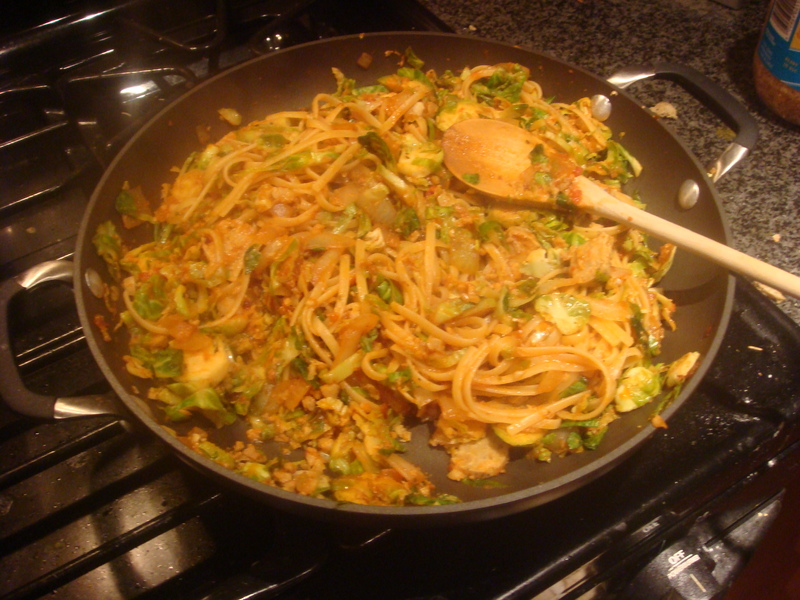 Pasta is one of those foods that is a staple in most households. It’s easy. It’s versatile. And it’s delicious. But have you ever seen the recommended serving of pasta? Let me tell you, it’s not a lot of food. I am definitely one of those people who thinks that more is always better, so throughout my years on weight watchers, I’ve learned how to make 1 cup of pasta into a huge portion. My trick? Load it with vegetables! I’m going to Boston this weekend so last night I played the “let me look in the fridge to see what produce needs to be used” game. The winner was Brussels sprouts. Are you groaning? I didn’t grow up eating them, so I don’t have that deep-seated hatred for them that many people have. 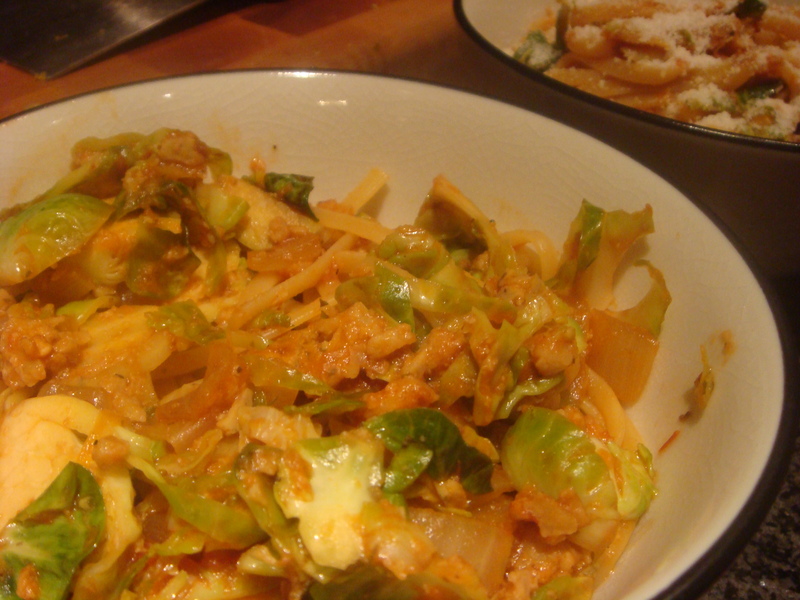 In fact, for the past year, I have been having a love affair with Brussels sprouts. They’re basically adorable baby cabbages after all. My favorite preparation is roasted with maple balsamic glaze, but my husband is generally not a fan of vegetable only side dishes. So tonight I decided to try a new method of preparation. And it went very well. The directions are easy too. First, cook linguine according to package instructions. In a large skillet, saute onion and garlic over medium heat. While that is cooking, trim the Brussels sprouts (cut off the stem and pull off any discolored or tough outer leaves) and slice thinly. The technique I used was to lay the sprout on its side and slice until I got about half way through. I rotated it and continued slicing. There’s no wrong way to do it. 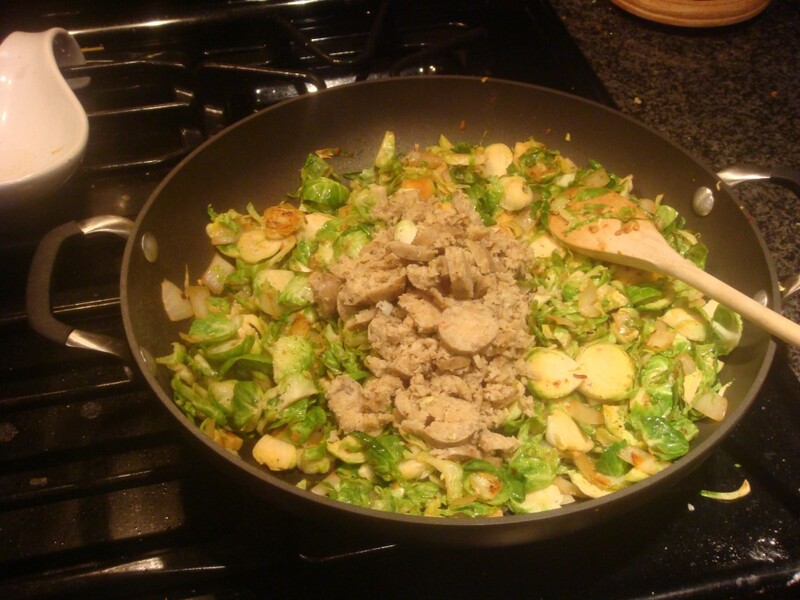 Add the Brussels sprouts to the skillet with garlic salt and red pepper flakes and a little extra olive oil if you need. Increase heat to medium high and stir occasionally. 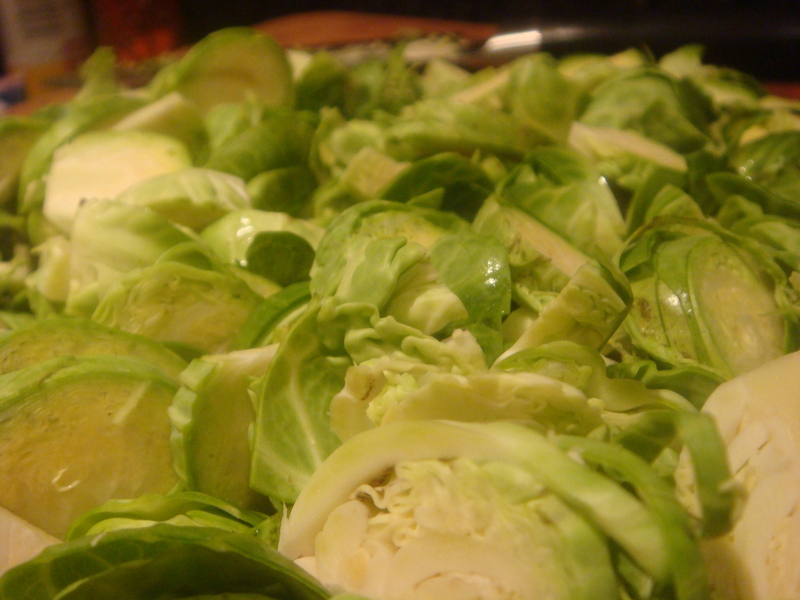 Because the Brussels sprouts are all different sizes, some will get brown and crunchy while others will steam. This is perfectly fine. Everyone loves a little texture contrast! In the mean time, defrost the sausage and rough chop it to create crumbles. I love the flavor, protein level, and ease of veggie sausage and you can’t tell the difference when its mixed in to a pasta dish. You can certainly use pork, turkey, or any other kind of real sausage in this dish. If you do, you’ll want to cook the sausage first, remove it and then use the grease in the skillet to cook the rest of the ingredients.